Last night my beloved Green Bay Packers were defeated the NFL's Monday Night Football game. It was not just any lose, this one will be talked about for a long time, possibly forever. The game came down to a Hail Mary throw to the end zone that ended the game in dramatic fashion to say the least. 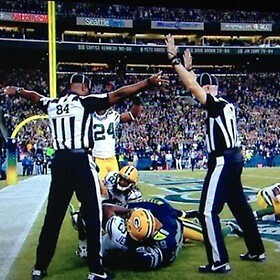 My personal thought is: that it is pointless to blame the replacement refs for a bad call that decided the game. If Green Bay quarterback, Aaron Rogers, threw one or two touchdown passes, instead of being sacked eight, yes eight times, in the first half; the game would have a much different ending. But that didn't happen and everybody in the free world knows it by now. Football fans around the country are screaming "get the striking regular refs back on the field." One might argue this is a great thing for the regular refs. But is it? I think the regular refs should be scared. Each week the football fans, the announcers, the call in talk show hosts, etc. are over analyzing every play of every game and questioning every call. Judging the replacement refs, comparing their call to what they assume the regular refs would do. In most people's eyes, right now; the replacement refs can do nothing right and the striking refs would have called the plays perfectly. With each week the regular refs are off the field, their assumed judgment improves with every play of every game. Again, the regular refs should be scared. When they resolve their issues with the NFL and take the field, they better be perfect. Because that is what will be expected and that is also impossible.